After a rough time at the Japan Grand Prix, which resulted in Ferrari drivers Sebastian Vettel retiring early in the race due to faulty spark plugs, and Kimi Raikkonen earning a well-fought fifth-place finish, the Ferrari team has struck success at the North American Grand Prix earlier this week. Ferrari truly hit its stride this weekend at the North American Grand Prix at the Circuit of The Americas, located in Austin, Texas. Top Ferrari driver Sebastian Vettel achieved a second-place finish, while his fellow Ferrari driver, Kimi Raikkonen placed third. The action-packed race was filled with fast-paced passes and plenty of dramatic moments including after the race when it was reported that Red Bull Racing TAG Heuer driver Max Verstappen had left the track with all four wheels while passing Raikkonen for third at Turn 17, thus awarding Raikkonen third place. In the end, Vettel claimed second place with a time of 1:331:01.134, just 10.143 seconds behind the first-place finisher, Mercedes driver Lewis Hamilton. With Raikkonen’s third-place finish, he achieved a finishing time of 1:331:06.770, which was only 5.636 seconds behind Vettel and 15.779 seconds behind Hamilton. With only three races to go, Ferrari is positioned to achieve a strong finish, however, their titles have not been decided as of yet. From a mathematical standpoint, Vettel has 265 points, maintaining stiff competition with Hamilton, while Raikkonen has 163 points. Time will only tell how this exciting season of Formula One races will end for the Ferrari racing team, as they head to the competition’s third final race, the Mexican Grand Prix on October 29. 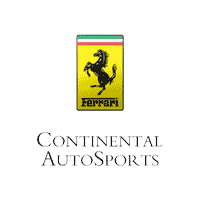 For more information on Ferrari’s performance in the Formula One Racing Championship, be sure to check out the rest of our blog here at Continental Ferrari. And if you’re interested in getting behind the wheel of a performance-based Ferrari vehicle of your own, take a look at our inventory available here in Chicago, IL.